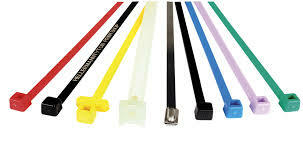 Cable Tie Manufacturer Leading Manufacturer of cable tie, uv cable tie, nylon cable tie, cable tie tool, cable ties and heat stabilize cable tie from Kolkata. Available in a wide range of materials, these cable ties all feature internal serrations allowing for a positive hold onto cable, hose and pipe bundles. The design of the head guarantees a high tensile strength whilst allowing a very low insertion force, this, combined with the bent tail design of many of the ties, ensures a simple and quick installation. Whilst easily installed by hand, manual and pneumatic (for high volume applications) tensioning tools are available to ensure a consistent and safe installation.